The Exhibition, supported by the Fondazione Cassa di Risparmio in Bologna, and produced by Genus Bononiae. Museums in the city and Arthemisia Group, is curated by Luca Ciancabilla, Christian Omodeo and Sean Corcoran. It is the first large retrospective dedicated to street art history. This project was created by Professor Fabio Roversi-Monaco, President of Genus Bononiae, together with a group of street art’s experts in order to start a reflection on how to safeguard, preserve and display these urban art-forms in museums. During the last fifty years, writing, street art and other similar artistic expressions, have deeply changed the way we relate to the urban space, thanks to new items such as aerosol spray cans and markers in the 1970’s and 1980’s, and to new digital technologies such as the internet and computers in the late 1990’s. 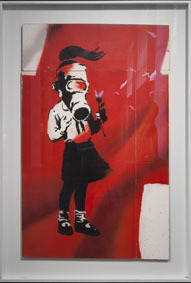 The Exhibition Street Art – Banksy & Co. represents a unique and original way to find out more about New York in the 1970’s and 1980’s and to appreciate a great selection of graffiti artworks of the 2000’s. The approximately 250 artworks and documents, displayed in the rooms of Palazzo Pepoli, tell an important chapter of the history of Bologna and invite visitors to work out a new way to look at and relate to the urban space. The Exhibition will display for the first time in Italy the collection donated by the American painter Martin Wong to the Museum of the City of New York in 1994. The Exhibition raises also more questions: What traces of these cultures are we transmitting to future generations? In what ways is it possible to safeguard this phenomenon? Which role will the museum play in this perspective? The need of a redefinition of the cultural politics in the urban space is urgent, since these artistic experiences deeply influence the world of graphics as well as people’s tastes and the art world in general.